When term time ends and the summer holiday comes around it’s easy to feel frustrated as a ceramics student; unless you’re lucky enough to have a home studio you end up, like I did, going home and counting the days until you have access to a throwing wheel or the opportunity to fire a kiln again. But the end of term doesn’t have to mean that learning new skills is put on pause. 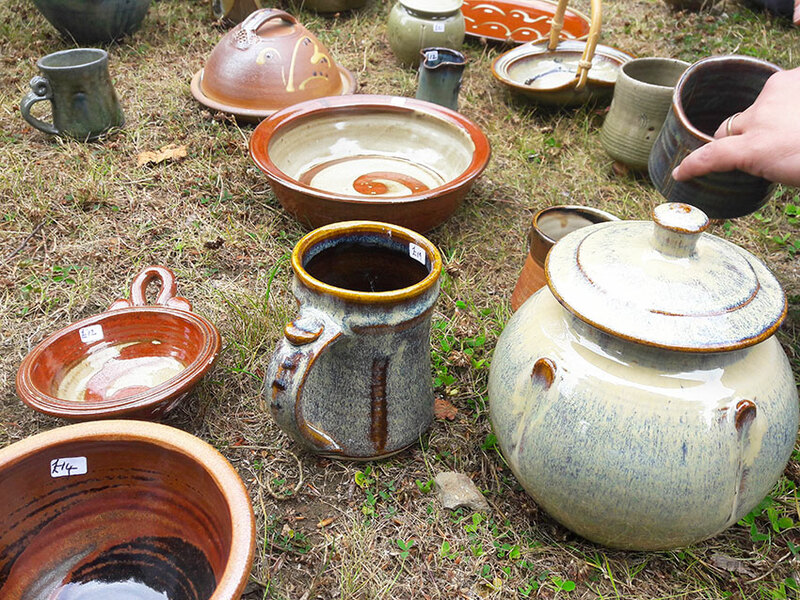 In my experience, if you show enthusiasm, potters are often more than happy to show you around their studios or allow you to help them with a firing. Occasionally some also offer workshops. Often these are expensive, but if you’re lucky you can sometimes find one at a reasonable price for a student budget like I did last summer. Some beautiful wood-fired work created by Joe. In July of 2018 I spent a weekend learning how to build a wood-kiln with potter Joe Finch and a small group of other potters in Pembrokeshire. I had experience of wood-firing while on an Erasmus exchange programme in Gothenburg. Eager to learn more about this traditional process, I had found the kiln building course advertised online. Linda Unsworth, a potter in the Preseli Hills had asked Joe for help building his design for a fast fire downdraft wood kiln in her garden. 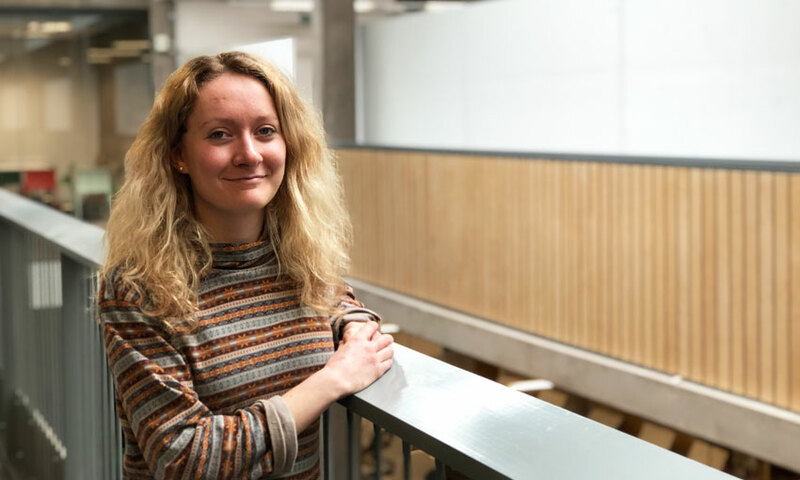 She had already sourced the materials and equipment – the job for the rest of us was to put it together. 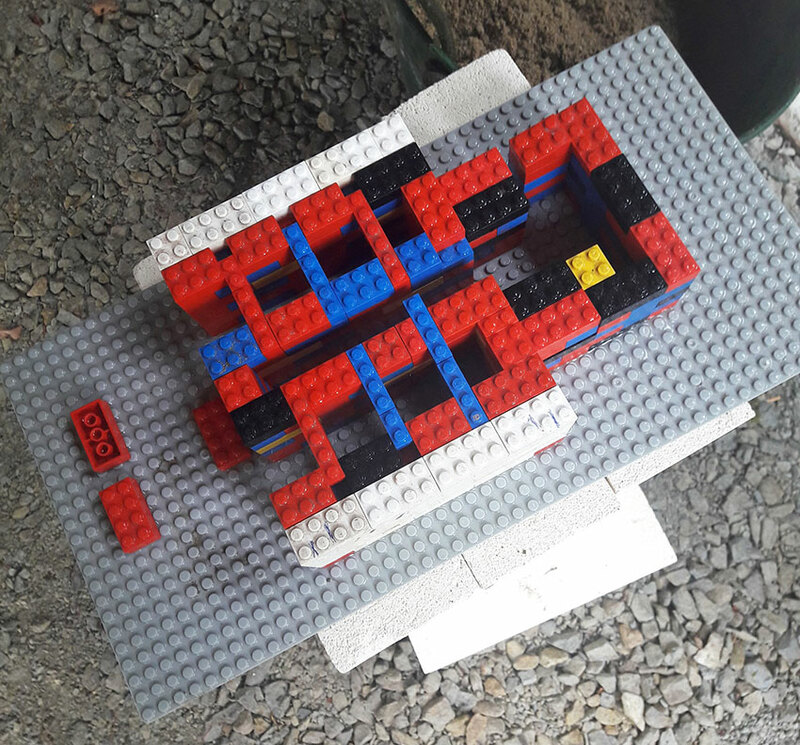 Joe’s Lego model gave us a perfect template for the kiln! 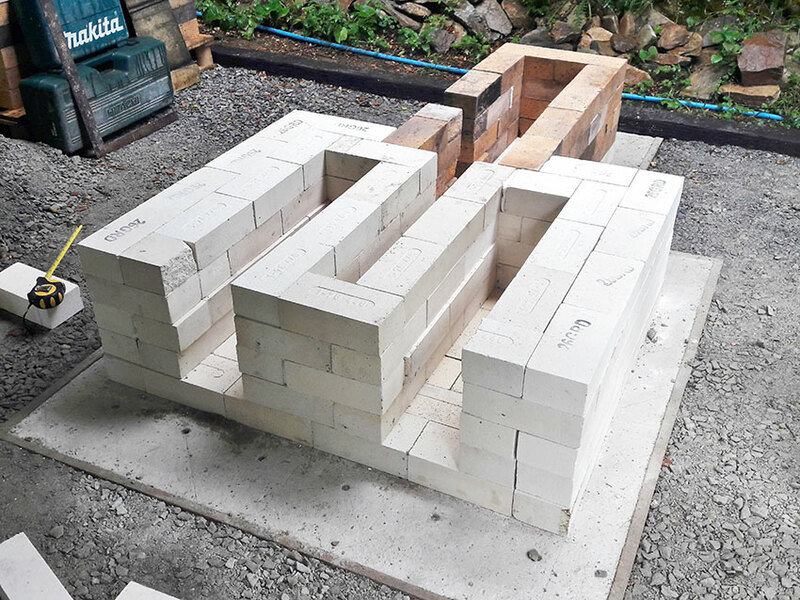 Working from Joe’s Lego model, he instructed us how to build the bricks up from a concrete base, lining the inside of the firebox with heavy, robust firebricks and the kiln chamber with lighter, insulating bricks. In the fireboxes we laid firebars onto which the logs would fall and catch fire. 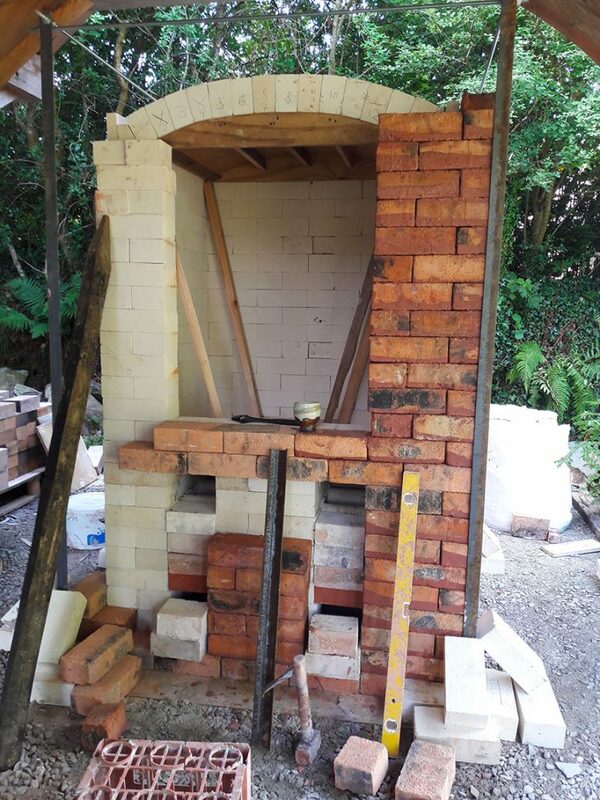 After the kiln chamber was about two meters off the ground, we used a D shaped wooden former and three layers of insulating bricks cut at angles to make an arch. The outer layer we clad in beautiful red molar bricks reclaimed from an old kiln. Although the building up of the bricks layer by layer was not a difficult job, cutting bricks to create spyholes was more complex, and scraping the old mortar off the reclaimed bricks required a lot of elbow grease. I was amazed to see the kiln take shape so quickly over the course of only two days. Working together as a team of potters and enjoying Linda’s home baked cakes, we fell into conversation about what had drawn us to working in clay. One of the potters had a studio space in London’s Kiln Rooms, another was a doctor in food microbiology and Joe himself has experience of building kilns all over the world including India and South Africa. Although we came from diverse backgrounds, it felt reaffirming to be reminded of the power clay has to bring people together like this. Understanding better how kilns work has given me the confidence to switch from electric firing to using the gas kiln at university and to achieve better results in my own work. I’ve also gained the knowledge and confidence to hopefully build my own kiln one day so I can share my love of this dynamic firing process. I came back from summer break with new confidence after learning new skills. 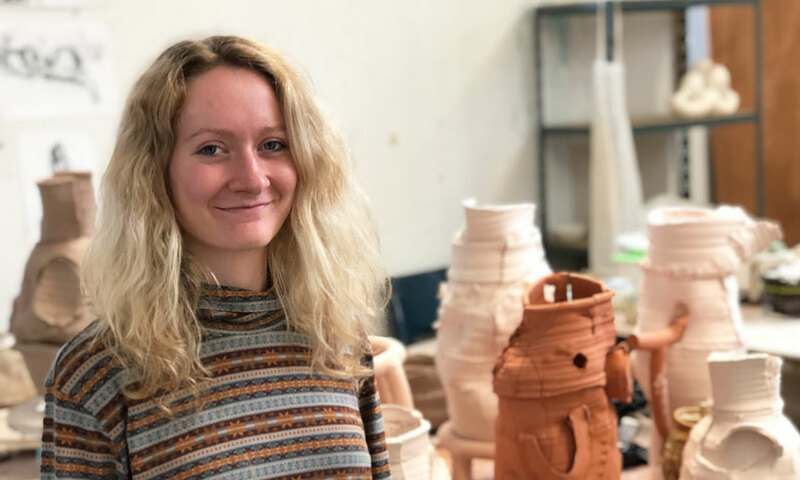 Taking part in projects like these in your own time becomes a fantastic way to make connections and learn about how others working in ceramics make a living. I am still in contact with fellow potters from the workshop almost a year later.